I keep checking email today to hear back from my friends, but alas, no responses yet so I'll just reach out and talk to you instead. I like my energy with my new schedule although I haven't yet repeated my first two perfect days on it. But I aim for it daily and am happy that when work hours are over, they are over and I move onto taking care of my family and the household stuff. 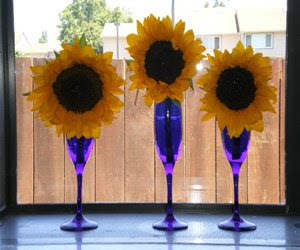 My friend Lisa came over to learn about possibly selling on Etsy and her gift to me were 3 big amazing sunflowers! I had just recently visited my sister in the country and we drove by a huge sunflower meadow but just 2 days before, Sis said, all the flower heads dropped to face the ground to go to seed...waaahhhhh I said...so the surprise of these sunflowers was wonderful and well timed. I visited a Japanese $1.50 store called Daiso yesterday...didn't know it was only 4 miles from my house until Sandy told me...thanks Sandy! 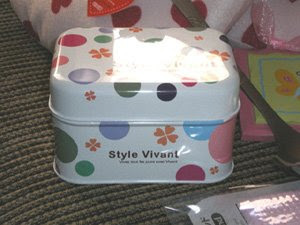 It's filled with all kinds of little goodies and only a few are over $1.50...tons of decorative dishware so if you need bento boxes or chopsticks or rice bowls there is an endless array. I got the little tin you see in the photo and it's the perfect size for my business cards just as I'd hoped. Sandy said she won't go with more than a $20 bill on her first visit so I had to just laugh when I looked at my receipt and minus the tax I had spent exACTly $20...funny. It's just beautiful today. The bay area is finally back to blue skies, mid-70's temps and a cool breeze. For a while I felt like I was living in smoggy China or the achingly heated central valley! The weather over the past three years has taken us away from our very predictable, awesomely fantastic mid-range temperatures...I mean you just don't have central a.c. in my area because until recently we just didn't need it. Now, hop over the hills and 20 minutes away you better hope you have a.c.! But not here and not in my amazing home town of San Luis Obispo, CA. Gosh, during summers there it was guaranteed fog until 11 a.m. and until 3 p.m. you just soaked up sun in your swimsuit or shorts but were always armed with warmer clothes in case you didn't make it home to change when the fog rolled back in and the cold air swirled through downtown shops. A light sweater in the evening and you were good to go. So it's taken me two very weird hot summers to finally accept that when we get incredible days like the ones we used to take for granted, they are a grand blessing indeed. Well, I think I got my chat fix. Be sure you check out my previous Iron Cupcake Earth post if you want to win spectacular cupcake prizes being added to the ever growing cache and come back soon because I'm just about to hit my 100th blog post! Thanks for lettin' me chat atcha. Iron Cupcake Earth is the central hub for the ultimate world-wide cupcake competition. There you will find a monthly ingredient, a monthly challenge, FABULOUS PRIZES, and new ways to find other cupcake fanatics just like yourself. This is an opportunity to be involved with cupcake baking contests where you can be a winning cupcake baker or just a voter. Either way, it's really fun to see the creations and now, we'll be seeing them from around the world! Here's the deal...be SURE you mention me as your referral...this is the secret into winning the big prize! And if you are a blogger, you can win too! So, make sure you read the details to have a proper win. Click the photo above for all the details. This is going to be fun! Do you see this SOLID FINE silver cupcake??? 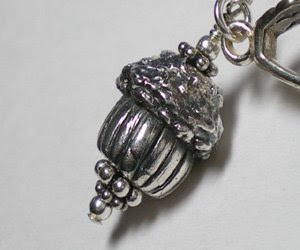 Yep, that's just what you are looking at...not sterling silver and not just a silver cupcake but a solid, not hollow awesome hunk 'o silver at .999 fine silver quality. Isn't it spectacular? Payton Jett of the Green Glass Cafe toiled over this precious metal clay that when fired, turns to .999 fine silver. She shaped the entire piece by hand creating realistic cupcake lines and frosting. It's quite a wonder. This is just one of the many pieces of jewelry I've designed this week after reorganizing my studio and family time. I completely flip flopped what was not working before and when I finally calculated the best way to structure my day to achieve balance, within 2 days it's just become awesome. Here's what I am doing: rising early and enjoying my morning coffee all by my wee self and preferably out in my small and shady front yard the sun has not yet reached. I listen to the birdies and do a little reading and enjoy the peace that exists before the nearby condo construction resumes for 12 hours...seriously. unnecessary night time snacking & later bed time. And when I get back home? It's straight to work and I'm really ready by then...revved up and excited about achieving my jewelry goals. I design pieces, calculate their cost in a very cool little black journal and photog them. This takes place until noon, so it's usually about 3-4 hours. Then my husband comes home for lunch and after that I'm ready to do laundry, errands, get some groceries or putter around up to dinner time. I used to run around unTIL noon on errand days and then hung out until I fixed dinner (early for us...about 4pm so I'd start at 3) and then just wouldn't feel like working at night. It just wasn't a productive time and for some reason it took a while to figure out the reasons. But I'm on track now and the first two days were just perfect and I created 12 small pieces, 3 of which you see here. Megan Ballarini (cool name, huh?) 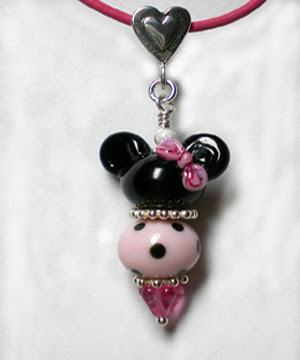 custom designed Minnie's body bead and Carrie McKinney, the custom ordered Minnie head with pink bow. It's a pendant that has matching earrings. And the fabulously talented Lezlie Belanger crafted the Cherry Cupcake. All of these pieces and more are being listed on www.RockerJewlz.Etsy.com, one or two a day over the next 5 days. Oh man, wait until you see the Luscious Ice Cream Sundae pendant...it's on Etsy right now! Holy smoke is for fire news, the fact that this is my 95th blog posting AND that I have important business news. The Napa wildfire wasn't even 2 miles from my sister's home. 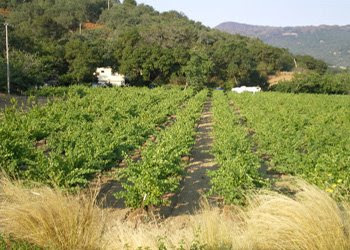 Is this vineyard a great view? 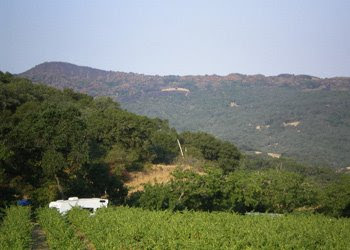 It's from the driveway at the top of a small hill on which she lives...she and her family get to enjoy it but it belongs to the neighbors so it's like having a vineyard you never have to care for! So that ridge in the background is where the fire was. Next photo is a closeup: all those pale, pinky/rusty looking trees are what burned. Sis's family watched the flames at night time...eeek! Just over 4,000 acres burned, mostly on the back side of this ridge. The first day of blue sky was such a blessing and it wasn't until I saw the still-there smoky haze contrasted against the blue that I realized just how bad the air was. It was a treat to be able to communicate much more easily with him...just wonderful. So my business news is that based on some recent snide comments about my business by some family, it hit me that they don't see it as a real job....because I wasn't treating it like a real job but a hobby. I then had a wake up call when I heard someone say they had committed themselves to do all they could to have a successful business and that's when I knew what was missing in mine: commitment. So after I get my business taxes taken care of this week, my focus will be on creating a commitment statement and specific goals that will drive me to work more diligently to achieve success. I have never been much of a goal setter but I find after recent illuminations into the manner in which I live my life that I am excited about making it more of what I want, and that includes my jewelry and paper goods business becoming more profitable, especially for my husband's looming retirement....not for several years yet, but something for which planning is key. I already know that the best fit is to enjoy my morning coffee and breakfast and then perform my important skin care and hair styling so I can feel ready for the day. I'd like to add yoga, meditation and bible study to the mornings and then move on to working in my studio. After that, when people start returning home from work, I won't see them as distractions as I did when I tried to work in the afternoons...and can focus on dinner plans, laundry, errands, etc. to keep the house in order and enjoy my family. This may sound simple but it's a very big switch in how I've been managing my time until now! On the jewelry front, I'll be working with more large black & white beads and incredible bird pendants with bird focals from Green Glass Cafe. I hope I've entertained you a little and am glad you visited. 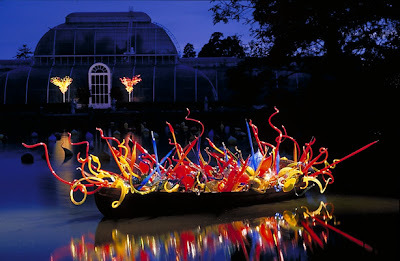 Okay, so Chihuly (chi as in chick...chi-hoo-lee) is Dale Chihuly the amazing glass blower. Yes, gang, these photos are of glass art! He no longer works the glass due to one blinded eye & an arm injury, but he directs his team to make his vivid dreams become spectacular realities...and his work is just across the bay from me in San Francisco...I'm so excited I'll be able to see his work on display for a mere $15 at the DeYoung! It's kind of funny because these 2 photos were taken of displays he installed at Kew Botanical Gardens outside of London, England...just a couple of years after I visited London! So I never saw them but knew nothing of him at the time anyway, so I'm much happier about seeing them now that I've seen awesome work on his website (click his name above) and a t.v. documentary. 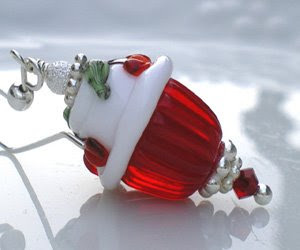 Since I live in a world of glass beads, I find his pieces breathtaking as he has glass blown into ridiculously simple or intensely detailed objects. 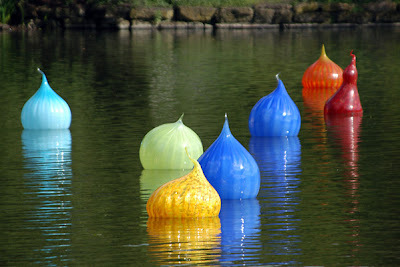 You should see him freely tossing the bobbing balls (left) into the water as if they couldn't break...eeek! I had to laugh recently when "Frasier Crane" on "Frasier" yelled at his father (who nearly knocked over the Chihuly bowl on display in Frasier's apartment)..."don't hit the Chihuly!" Imagine what panic he would have felt seeing these glass bobs tossed! On a different vein, although the bay area was surrounded on all four sides at one point by very distant wildfires, we still had heavy, smoky air for several days that blotted the blinding rays of the sun with a kind of gray haze that reduced the view of the sun to a deep orange cutout in the sky. Rather an end-of-the-world feel. What a sigh of relief it was to see patches of blue sky return! I'll be playing Auntie to my godson next week and won't have much access to the internet or my beads, so my business goal is to get my icky taxes reported and to sketch and draw quite a bit so I can get rolling on listing drawings on www.MomsArt.etsy.com along with prints of my son's and my mom's drawings as well. What are the subjects? Hmmmm...welllll okay, just a hint...anatomy and botany...nope, that's all you get and you'll just have to savor the sweet ache of anticipation until then! I'll be shipping jewelry and craft supplies Monday, July 7th and then again around July 16th.